This Ear Model by 3B Scientific is an anatomically accurate replica of the bones of the inner human ear. The three smallest conjoining bones in the body, the malleus (hammer), incus (anvil), and stapes (stirrup), are here englarged to twenty times their natural size, giving ENT students the ability to study them in greater, closer detail. Often referred to as the "auditory ossicles," these bones are responsible for transmitting sound from the eardrum to the inner ear and mechanically amplying the sound. 3B's Ear Model shows a cast and enlargement of original ossicles created using micro CT scans. 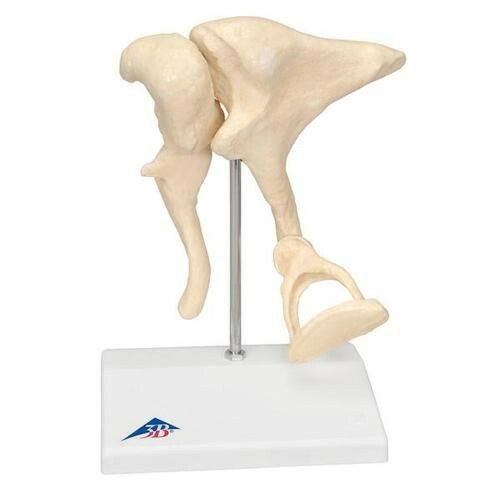 Made from durable, synthetic bone-like material, but weighing in less than a pound, this model is a great value for any office or classroom. Vitality Medical also carries other anatomical models, such as the 3x Life Size Outer Ear Model and the Nose Model with Paranasal Sinuses. Anatomically Accurate Model of Human Auditory Ossicle, 20 Times Life Size. Replicates the Malleus (Hammer), Incus (Anvil), and Stapes (Stirrup) Bones. Made From Durable, Unbreakable Synthetic Bone-Like Material. Comes With Metal Stand For Convenient Display. Great For In-Depth Study of Inner Ear.